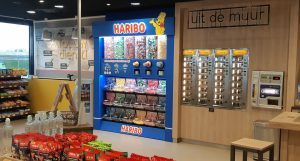 In joint cooperation with Haribo and Total this beautiful tempting candy pick and mix display, made by Food Dispense, has been installed at Total Leiderdorp in the Netherlands. The design and lighting really stands out in the shop environment. Lots of Haribo lovers like it very much. Are you looking for a great design to boost your brand? Please mail us and share your thoughts with us!